Little, Brown Books for Young Readers, 9780316213882, 40pp. Jean-Michel Basquiat and his unique, collage-style paintings rocketed to fame in the 1980s as a cultural phenomenon unlike anything the art world had ever seen. But before that, he was a little boy who saw art everywhere: in poetry books and museums, in games and in the words that we speak, and in the pulsing energy of New York City. 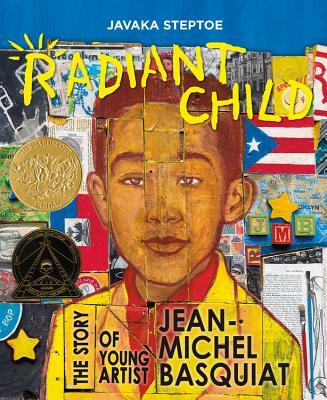 Now, award-winning illustrator Javaka Steptoe's vivid text and bold artwork echoing Basquiat's own introduce young readers to the powerful message that art doesn't always have to be neat or clean--and definitely not inside the lines--to be beautiful. Javaka Steptoe is a Caldecott and Coretta Scott King Illustrator award-winning artist, designer, and illustrator. His debut picture book, In Daddy's Arms I Am Tall, won the Coretta Scott King Award, and Jimi: Sounds Like a Rainbow (written by Gary Golio) received a Coretta Scott King Honor. He has also illustrated Do You Know What I'll Do? by Charlotte Zolotow, A Pocketful of Poems by Nikki Grimes, Amiri and Odette: A Love Story by Walter Dean Myers, Rain Play by Cynthia Cotten, and Hot Day on Abbott Avenue by Karen English, which received the Jane Addams Children's Book Award. He is also the author and illustrator of The Jones Family Express, as well as the Caldecott award-winning Radiant Child. Javaka invites you to visit his website at Javaka.com. *"Vibrant colors and personal symbols channel the 'sloppy, ugly, and sometimes weird, but somehow still BEAUTIFUL' paintings, incorporating meticulously attributed collage elements and capturing the artist's energy and mystery. Stellar bookmarking--a riveting portrait of a young artist."